“These dogs are notoriously unreliable and, in any case, vindictive handlers can have them ‘indicate’ on a visitor on command. Using these dogs on the visitors of Republican prisoners is baseless intimidation, given that NIPS has long accepted that we do not abuse such substances. These incidents were followed by verbal abuse being directed at another visitor by screws as he left a visit.It is clear that this is a deliberate and concerted effort to attack prisoners through the harassment of our families. Republican prisoners, Roe 4, Maghaberry gaol. Posted on November 7, 2018, in British state repression (general), British strategy, Democratic rights - general, Historiography and historical texts, Prisoners - current, Repression and resistance in the six counties today, Saoradh, six counties. Bookmark the permalink. 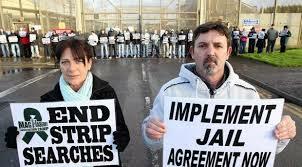 Comments Off on Roe 4 prisoners on “upsurge in harassment against our visitors”.